Rian Pozzebon talks Ten Years of Vans Syndicate | F.G. Mention Vans Syndicate to any skateboarder that take pride in their shoe collection and it would be surprising if you aren’t not met with anything but a positive opinion and list of regretful missed releases. While focusing on a specific theme is nothing new for shoe collaborations, the relationship of collaborating individuals with the design team at Syndicate over the last ten years is one of the factors that has set Syndicate above other ‘premium’ lines. Developing more than just one off colourways, silhouettes have often distinctly varied from their classic counterpart with each release telling a story. A decade into the program came the surprise announcement that Vans Syndicate would end here. More startling was the news this was not an early curtain call but actually its intended lifespan with the final ten year anniversary release arriving at skate shops last Friday. I got in touch with Rian Pozzebon, Syndicate’s footwear design manager, to gain some insight into what sort of experience this been for himself and those involved since 2005. Can you explain how you became involved with Vans? I grew up in a time of skateboarding when lines were blurred, everyone around me seemed to create things outside of skateboarding; photography, zines, music, paintings, films… It all had a DIY feel with no one being qualified. Being surrounded by this made me believe that if I wanted to do something, I should just go and do it. My background ranges from starting a backpack company in the mid 90s to being the sales manager for Stussy, then taking a career turn accepting the footwear design position with my friend Jon Warren at Vans to help rebuild the skate program in 2002. We were sort of a package deal, one wouldn’t come without the other. How did Vans Syndicate come to be? Jon and I found that the industry was saturated with puffy skate shoes built for the mass market and wanted to reintroduce the 90s’ creative spirit back into the skate shops. Reminiscent of the days when a shop owner or employee talked the young mind into buying the independently spirited brands like Consolidated or one of the Dwindle Distribution graphics of Marc McKee and Sean Cliver over a Tony Hawk board. Why did you feel it was important to have a more premium equivalent to the Pro Skate line? There is a consumer out there that wants more and our challenge was to rise to the occasion and build product around it. The handcuffs were off with Syndicate, we didn’t have to compromise due to selling five more pairs if we made the outsole white or the upper material cheaper. Syndicate Authentic 69 Pro “S” – released in February 2013. 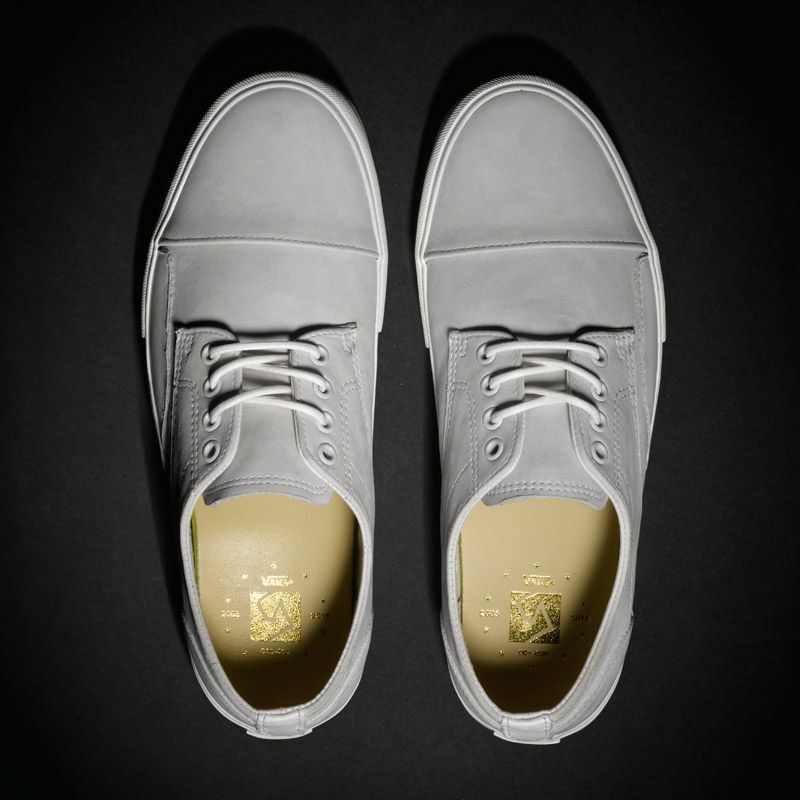 Until the introduction of the Authentic Pro this year, Vans had not produced a more durable equivalent to the original. Features of the Syndicate Authentic included a pig suede upper, pro insole and outsole, tonal checkerboard side panel print, DRi-LEX® moisture wicking lining along with a heel pull tab used exclusively on this model. Image courtesy of Silo Store, learn more on the development process of this specific model from their interview with Neal Shoemaker here. Could you sum up what you believe each Vans range provides or represents? What are your personal favourites from the capsules you have worked on over the years? I am sorry but this can’t be answered as I have been fortunate enough to dive so deep into the project with the people involved that they all carry such a heavy weight of connection. The shoe I wear the most can be answered with Luke Meier’s Zero Lo “S” which is also known as the Seylynn “S”. For me the most important part of the process is building a relationship and diving deep into their environment. Seeing the studio of Shawn Stussy or going on set with Ice-T, absorbing their world to build a story is what it was all about for me. These experiences changed my perspectives on design and on living. Were there any rejected ideas for Syndicate projects? Tons of rejects. Fortunately, Syndicate was built on a foundation that didn’t need to make anyone happy for it to survive and continue. I will forever be thankful that Vans gave us the ability to do this. It allowed pure honesty between the company, us and the people we worked with. Development of the Authentic 69 Pro “S”; note the heel box on the left resembles a classic Vans Authentic, the middle in the same style which is now used on the Authentic Pro and right showing the design unique to this model. Photo: Silo Store. Why was Syndicate only intended to run for ten years and where will it go from here? What affect do you feel the Syndicate program has had on Vans as a brand and skate footwear as a whole? I have never thought about this question… It was personal: friendships were used on all parts to challenge each other. Project after project, exhibition after exhibition and year after year. Finding myself eight years into this and comfortably explaining to Ice-T on the set of Law and Order that he should work on a project with Vans, a billion dollar company, for Syndicate and get such an insignificant amount of money has me reflecting on how important friendships are. When you present something honest, even under an umbrella as large as Vans, people found something genuine and signed on. Thank you to the OG, Jon, Jay, Tom, Berto, Pete, and the later crew with me; Dazz, Justin, Kathy, Nate and the guys. I am excited to see what is next from the minds of Trevor Hill and Neal Shoemaker. Stay tuned. All imagery courtesy of Vans & Vans Syndicate unless credited otherwise. Tags: Ice T, Mister Cartoon, Rian Pozzebon, Vans Syndicate. Bookmark the permalink.